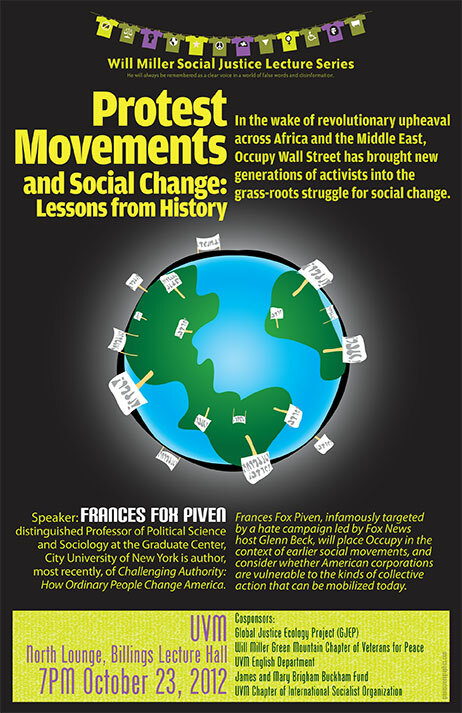 We rescheduled Frances Fox Piven for October 23, 2012. As you may recall, she was unable to come to Vermont last spring, due to illness. Her lecture topic remains timely and we hope you will be able to attend. Our usual location on the UVM campus was not available, so please note our new location. In the wake of revolutionary upheaval across Africa and the Middle East, Occupy Wall Street has brought new generations of activists into the grass-roots struggle for social change. Distinguished Professor of Political Science and Sociology at the Graduate Center, City University of New York is author, most recently, of Challenging Authority: How Ordinary People Change America. Francis Fox Piven, infamously targeted by a hate campaign led by Fox News host Glenn Beck, will place Occupy in the context of earlier social movements, and consider whether American corporations are vulnerable to the kinds of collective actions that can be mobilized today. Why Does the US Have a Global Empire? 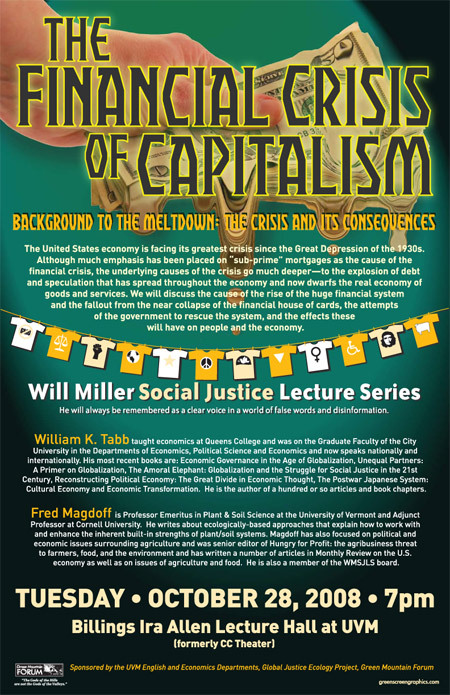 The Will Miller Social Justice Lecture Series is proud to host Michael Parenti, an internationally known, award-winning author and lecturer. He is one of the nation’s leading progressive political analysts. His highly informative and entertaining books and talks have reached a wide rage of audiences in North America and abroad. Michael Parenti’s talk will be like a bright spark of hope for people who are fighting for the survival of the planet and defending themselves against the Empire and imperialism. A powerful and honest presentation that will be hated by those who run the Empire and loved by people who are searching for the truth in Western propaganda. Thursday, November 10, 2011 @ 7pm, UVM Davis Center 4th floor, Silver Maple Room. Jihan is the Native Energy Organizer for the Indigenous Environmental Network. She is Navajo and African American, and organizes with native communities throughout the US and Canada against the impacts of energy development and climate change. Jihan works on the front lines of the global movement for climate justice. She will discuss how social movements around the world will mobilize during the UN Climate talks in Cancun this December to create real, effective and just solutions to the climate crisis as an alternative to the unjust, market-driven Copenhagen Accord that came out of last year’s UN climate talks. Heather Rogers, author of Gone Tommorow: the Hidden Life of Garbage, will speak on new book, Green Gone Wrong: How Our Economy Is Undermining the Environmental Revolution. 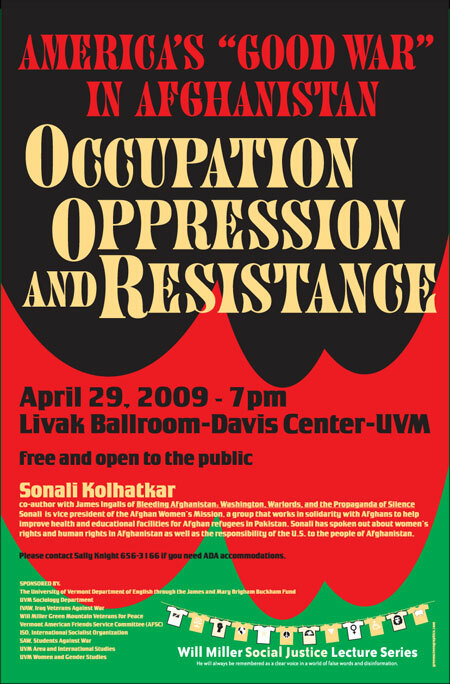 Thursday, April 21, 2011 @ 7pm, UVM Davis Center 4th floor, Livak Ballroom. Sonali Kolhatkar, co-author with James Ingalls of Bleeding Afghanistan: Washington, Warlords, and the Propaganda of Silence. Sonali is vice president of the Afghan Women’s Mission, a group that works in solidarity with Afghans to help improve health and educational facilities for Afghan refugees in Pakistan. Sonali has spoken out about women’s rights and human rights in Afghanistan as well as the responsibility of the U.S. to the people of Afghanistan. Please contact Sally Knight, 656-3166, if you need ADA accommodations. 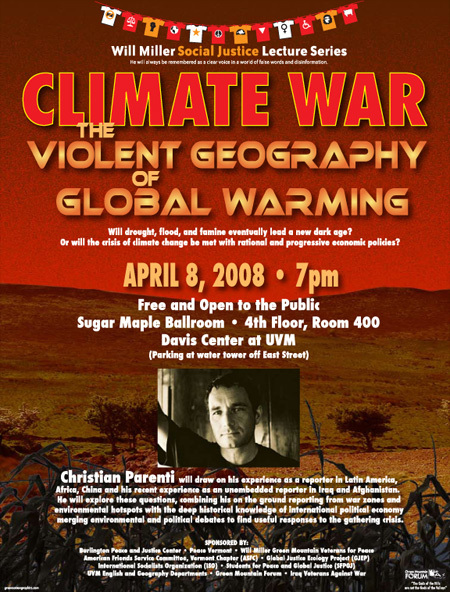 SPONSORED BY: UVM Department of English through the James and Mary Brigham Buckham Fund, UVM Sociology Department, Iraq Veterans Against the War, Will Miller Green Mountain Veterans for Peace, Vermont American Friends Service Committee, International Socialist Organization, Students Against War, UVM Area and International Studies, UVM Women and Gender Studies. The United States economy is facing its greatest crisis since the Great Depression of the 1930s. Although much emphasis has been placed on “sub-prime” mortgages as the cause of the financial crisis, the underlying causes of the crisis go much deeper-to the explosion of debt and speculation that has spread throughout the economy and now dwarfs the real economy of goods and services. We will discuss the cause of the rise of the huge financial system and the fallout from the near collapse of the financial house of cards, the attempts of the government to rescue the system, and the effects these will have on people and the economy. Globalization and the Struggle for Social Justice in the 21st Century, Reconstructing Political Economy: The Great Divide in Economic Thought, The Postwar Japanese System: Cultural Economy and Economic Transformation. He is the author of a hundred or so articles and book chapters. agriculture and was senior editor of Hungry for Profit: the agribusiness threat to farmers, food, and the environment and has written a number of articles in Monthly Review on the U.S. economy as well as on issues of agriculture and food. He is also a member of the WMSJLS board.